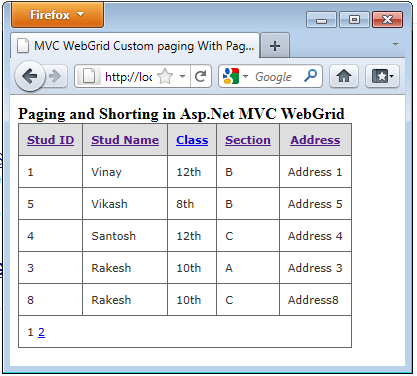 In this article I will show you how you can how to bind data and add custom paging with page no and shoring of webgrid by using entityframework in asp.net MVC using C#.Net. In this I will fetch data from data base by using linq query in c#.net and lenda expression. In this I have used asp.net, mvc, c#.net, webgrid, entityframework, lenda expression and linq query. 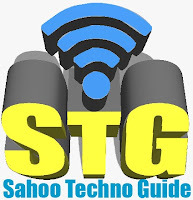 Some of my previous articles are as follows: How To Disable Sorting in Asp.net MVC Webgrid, How to Bind Data to Webgrid in ASP.net MVC Using C#.Net, Code to Select All Checkbox in GridView in Asp.Net Using jQuery, Highlight GridView Row on Mouseover Using CSS in Asp.Net C#.Net, Drag Drop Cells in GridView Control Using Asp.net C# and jQuery, Track and Display Error Message in Asp.Net MVC Application Using C#.Net, Simple Login From in Asp.Net MVC Using C#.Net, Bind and Retrieve ListBox Selected Value in MVC Using C#.Net, Bind DropDownList Using Entity Framework in ASP.Net MVC Using C#. Now we will come to our controller end and add the below code in your controller. 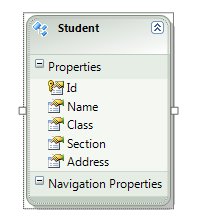 In above code I have first created instance for the entity class. After that we have used linq query to access the value from table. After that I have assign it to model. Now we have done at controller end. We will create view and add the below code in our view. When you move to some page and again do the sorting, it will take you to the page1. Can you please clarify on this issue?